The sporty yet elegant design is harmoniously coordinated conveying both aesthetics and dynamics. Engineered from the ground up to be efficient, beautiful and comfortable, it handles like a sports car but rides like a luxury sedan. The most noticeable change is the Y-frame design which gives added strength while allowing for additional heel clearance and ease in getting in and out. The equally noticeable triangulated rear end adds pedaling efficiency, better aerodynamics, reduced pedal steer and lower center of gravity so that you “stick” to the road even at higher speeds. The chro-moly steel frame is durable, more comfortable and provides a “passive suspension” with a smoother ride. 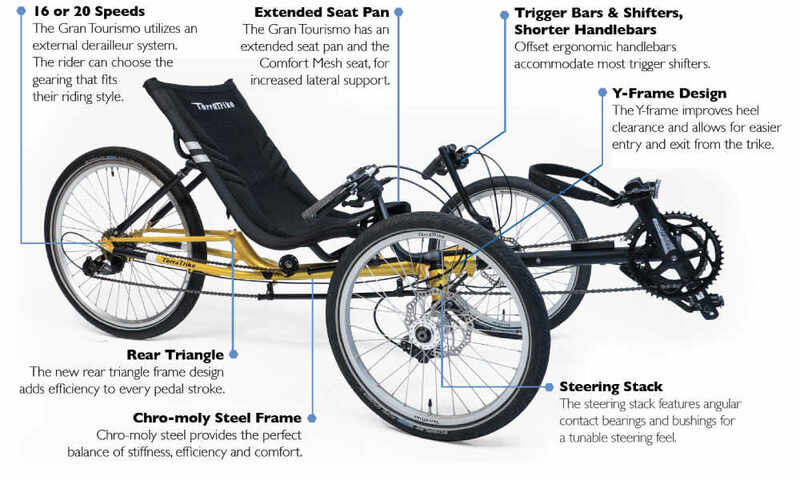 New seat mounting adds rigidity to the trike increasing efficiency with every pedal stroke. But it doesn't stop there. We’ve included direct steering along with TerraTrike’s own “steering stack” that provides a responsive yet predictable steering experience. The GT also comes standard with a 24” rear wheel for higher top-end speeds, all while rolling more smoothly over bumps and retaining momentum. To top it off, the aluminum seat frame, handlebars and tie rod reduce weight without sacrificing strength.